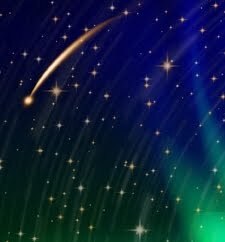 "Intuition blazes the trail for reason to follow." The path to discovery has always involved the guidance of intuition. In a previous entry, I mentioned that I choose to call myself "an intuitive researcher". I am not the first person to use that term, and I truly do believe intuition plays a part in ALL research. But I would like to suggest that intuition has not often been acknowledged in its proper place ~ hand in hand with the "rationalism" so many researchers choose to elevate alone. In truth, reason and intuition work in concert together, and when we surrender to the intuitive process, it is then that we make the quantum leaps of discovery for reason to validate. Indeed it is then when we progress the state of reason itself, by redefining what is truly "reasonable" and "rational", a standard that evolves over time with each new discovery about the nature of the reality around us. Those of us courageous enough to venture outside the box, choosing to research and analyze evidence of spiritual phenomena, know that reality is far richer than many choose to consider. In this blog entry, I will summarize and discuss the process of discovery related to my research into the 1881 "world-ending" prophecy associated with legendary 16th century prophetess Mother Shipton. In eighteen hundred and eighty one." When I first began to read about the "failed" and "forged" prophecy of 1881 associated with Mother Shipton, I decided to take a novel approach. Instead of viewing this prophecy as an open and shut case of fraud or failure, as almost everyone does, I found myself almost immediately exploring what actually DID occur in 1881. My own spiritual foundation has taught me that visionary experiences are not quite as well-defined as many people like to assume. I am quite aware that it is possible for someone to remotely view a likely event across time without having the faintest idea of what is actually being observed. Rather than repeat all that has already been written up in a very detailed analysis, I will refer you to the Prophecies section of my ShiptonProphecy.com web site ~ the August 11, 2010 entry entitled "A Star Falls, Winds Rage & Fear Rules: The World-Ending 1881 Prophecy Examined Anew". To clarify the high level of detail on the web site, I will summarize all the events that occurred in or around 1881 that could be interpreted as "the end of the world" by a remote observer, whether it was Mother Shipton herself or ANYONE who may have first uttered the words of the prophecy. On the web site, I also address in detail whether or not this prophecy could be forged by the 19th century writer Charles Hindley. He is said to have later admitted to fabricating the prophecy he recorded in a book he published in 1862, where this prophecy first appeared in print. He originally claimed to have found the prophecies in the British Museum, then was said to have retracted that claim in 1873, as the prophecy began to gain more notareity. There is no way of knowing with 100% certainty if this prophecy was indeed forged. All we CAN know is what actually did occur in 1881, based on the verifiable historical record. Many in Yorkshire were indeed looking for "the end of the world" in 1881 due to the prophecy, resulting in considerable dismay and unrest, but of course the end never did arrive. Because of the prophecy's "failure", long forgotten appear to be the actual events of that year...until now. The "Mother Shipton Meteorite" of March 1881 ~ A rare meteorite fell to Earth in Yorkshire on March 14, 1881, with "thunder-like" and "roaring" sounds announcing its arrival, heard far from its final resting place in Middlesbrough, with one report within 30 miles of Knaresborough. Its landing was witnessed by railway workers, who then recovered the stone. There is an unusual mystery associated with this stone, which still resides in the Yorkshire Museum. Etched into the rock appears to some observers to be an eerie image reminiscent of a classic Mother Shipton drawing from long ago, something we will examine more later. To my knowledge, the March 1881 Yorkshire meteorite has never before been associated with Mother Shipton or the prophecy of 1881. I believe I am the first to suggest that relationship. 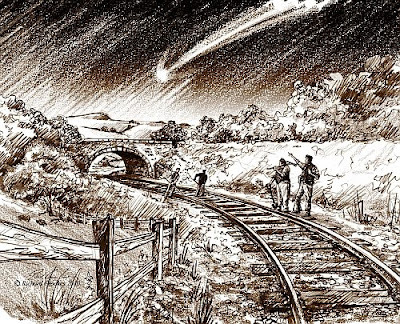 But we will leave the intriguing mystery of the meteorite aside for now and briefly discuss what ELSE of significance occurred in 1881, not only in the United Kingdom, but throughout the Earth. Again, I refer you to the web site ShiptonProphecy.com for more detail, as well as many links to resources providing historical validation. 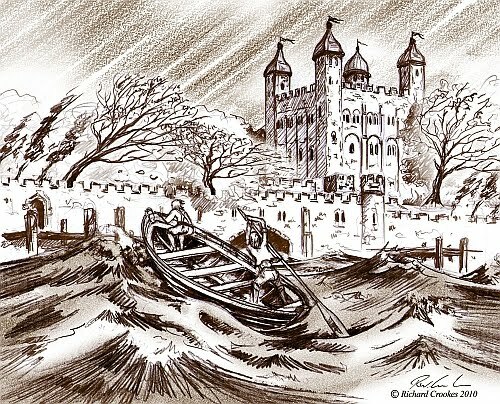 The Violent Windstorm of October 1881 ~ One of the worst windstorms in the history of the U.K. struck the region, associated with significant waves on the Thames (sinking at least one tugboat), the downing of 30,000 trees, as well as the deadly Eyemouth Disaster in Scotland. The Haiphong Taiphoon of September 1881 ~ The #3 deadliest storm EVER in the recorded history of the Earth killed 300,000 in Vietnam. The Georgia/South Carolina Hurricane of August 1881 ~ The #6 deadliest hurricane and #9 deadliest natural disaster ever to strike the U.S. killed 700 people and inflicted severe damage on coastal communities. The Khios earthquake of April 1881 ~ This 7.3 magnitude earthquake killed almost 8000 people near Turkey. The Indian earthquake of December 1881 ~ This 7.9 magnitude earthquake was a precursor to the great Indonesian/Indian earthquake and tsunami of 2005. The "Great Comet" of May 1881 ~ A very visible comet appeared in the Southern Hemisphere. As I justify on the web site, just for good measure, I am listing a few events occurring in the vicinity of 1881, given the inexact nature of remote visionary experiences and the extreme severity of these events. The Great Bombay Cyclone of June 1882 ~ The huge waves associated with this storm killed 100,000 people. The "Great Comet" of September 1882 ~ This comet is still considered "perhaps the brightest comet that has ever been seen", bright enough to be seen in the daytime sky next to the sun. 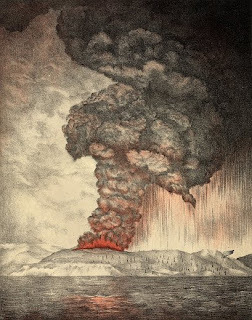 The Eruption of Krakatau (aka Krakatoa) in May 1883 ~ Though a year and a half beyond 1881, this eruption is considered one of the most cataclysmic events ever to strike the Earth in recorded human history, resulting in huge tsunamis, disastrous pyroclastic flows and ash clouds, impacting the weather world-wide for a significant period afterwards. I believe that all of these events present a case at the very least strong enough to convey that the period starting with 1881 was a time of significant Earth events, events powerful enough to attract the attention of a remote visionary, who might indeed interpret their appearance as "the end of the world". We may never know if it was Mother Shipton or Charles Hindley (or even someone else lost in history) who first surfaced this date. Some may insist it was no more than a "lucky guess" or a big "coincidence". I personally was astounded to find as many disastrous events as I did, far more than I expected and of much greater severity, and I wouldn't be at all surprised if a few more surface over time. I did ignore a couple here and there near to 1881 which I may mention in the future - events such as a particularly severe tornado and huge hail stones reported by some to be 17 inches in diameter in Iowa in June 1882 (but that report is also disputed by others). Hail is actually significant in relation to another alleged Mother Shipton prophecy, something I will discuss in the future. And now we will return to the mystery of what I have decided to call "The Mother Shipton Meteorite". It just so happens this was the very first unusual event of 1881 I discovered, despite it being arguably the most difficult one to find. I do believe intuition played a role in this process. As a person who has always had some interest in astronomy (and having reported a meteorite I observed falling in Oregon myself a couple years ago), I was for some reason initially very curious if any meteorites fell to the Earth in England in 1881. It also just so happens that this particular meteorite was in the news recently due to its rare composition, so it showed up quite readily when I began searching for meteorites in 1881 (quite a "coincidence" too). Then of course I went searching for a non-copyrighted image I could use on my web site, and I was fortunate to find one on Wikimedia Commons, contributed by Dr. Svend Buhl with the note "Meteorite Recon" (available for distribution under a GNU Free Documentation License). Something I noticed almost immediately due to my own familiarity with famous Mother Shipton drawings from history was the eerie etching on the stone resembling depictions of Mother Shipton herself. 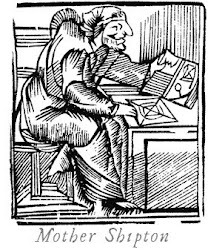 It just so happened this particular Mother Shipton drawing was one of the first I had obtained due to it ALSO being freely available on Wikimedia Commons. Indeed it has been on this blog and the web site for a while, long before I ever discovered the meteorite. What an odd coincidence that the image would be oriented PRECISELY the same way as the natural groove marks on the meteorite? Did some cosmic forger have its way with the grooves on the stone? I'm sure it could be determined if an Earthly forger could have done so, but that seems highly unlikely given its natural appearance. Yet still I underplay the significance of this observation since I know the "rationalists" among us will say it is simply a "coincidence", no different than the Mother Shipton moth, not to mention we will no doubt hear a discussion of how people see what they want to see, etc. Richard Crookes, the artist working with me on this project, saw other images in this view of the meteorite, including a horse and another rather difficult-to-see portrayal of a woman. Other photographs of the meteorite are under copyright, but even a view of a different side contains some rather unsual images, reminiscent of a game I played as a child (and repeated as a parent), in which you must make an image out of a random drawing. 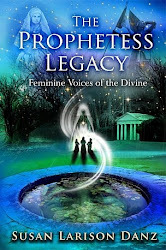 Interesting take on the concepts of prophecy before time. I am currently reading 'Entangled Minds' by Dean Radin on the workings of PSI and whether this is the human experience of quantum events with its associated lack of causality - one of the requirements of a Newtonian world. We live in interesting times. Truly. 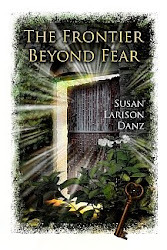 Copyright 2010-2012 Susan Larison Danz. All Rights Reserved. Watermark theme. Powered by Blogger.